As many of our studies address the interactions of pairs of proteins, such as a cytoskeletal protein with an integral membrane protein, we rely heavily on assays that measure binding. These assays vary in difficulty and in the nature of the data that they provide. The simplest assay of protein-protein binding is “blot overlay.” In this assay, also called a “Far Western” blot, a protein or a mixture of proteins (e.g., from a tissue extract) is separated by SDS-PAGE and transferred to an absorbent paper, usually composed of nitrocellulose. This “blot” of the separated proteins is stained with a visible dye to reveal the major bands of protein, then saturated with irrelevant proteins (e.g., BSA, milk proteins) and incubated with a second protein that we are testing. The second protein that binds to the blot is detected by antibodies to the protein or, if it is a fusion protein (e.g., with GST or MBP), with antibodies to the fusion partner. The following figure shows an example of a “blot overlay” in which we demonstrate the reduced binding to obscurin of sAnk1 variants with site-directed mutations in their ankyrin repeat domain. Another, relatively simple, assay of protein-protein binding is the “pulldown.” This assay typically employs a fusion protein with the protein of interest linked to GST, though other variants are also used. The GST-fusion protein is bound to a bead resin, such as Sepharose, that is chemically coupled to glutathione, to which the GST binds. The charged resin is then mixed with a second protein to be tested, or a mixture containing the second protein. After incubation, the beads are collected and the bound proteins are eluted either with soluble glutathione or with SDS-PAGE sample buffer. The bound proteins are then analyzed by SDS-PAGE and transfer to nitrocellulose, followed by antibodies to detect both the GST fusion protein and the second protein of interest. Co-immunoprecipitation is a variant of the “pulldown” assay that is typically used to learn if two proteins present in a cell or tissue bind to each other. In this case, an antibody to one protein is bound to beads and the beads are then mixed with a cell or tissue extract. After incubation, the beads are collected and the bound proteins are eluted with SDS-PAGE sample buffer. Bound proteins are analyzed by SDS-PAGE, and transfer to nitrocellulose, which is then probed with antibodies to each of the proteins of interest. 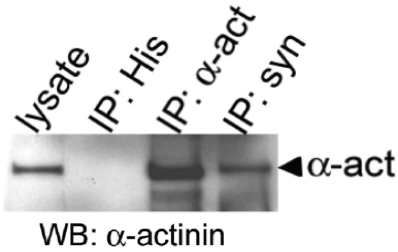 An example of antibodies to synemin that co-immunoprecipitate (IP) another cytoskeletal protein of muscle, α-actinin, detected by blot (WB: α-actinin; α-act), is shown below. All of the above assays provide qualitative information about whether a particular pair of proteins can bind to each other in vitro or in cells or tissues. For more quantitative approaches, we use Surface Plasmon Resonance, measured on Biacore Instruments. This method uses very small changes in the refraction of light, occurring on a surface where binding is occurring, to measure the binding and dissociation of protein pairs in real time. The rate constants for association and dissociation and the binding affinity can be readily determined. These experiments are typically done with purified proteins or fusion proteins, or antibodies and antigens. For more information on these methods, see www.biosensorcore.com. We use SPR extensively. An example of a kinetic study of the binding of the cytoplasmic sequence of sAnk1 to its high affinity binding site on obscurin is shown below. All of these methods use proteins that have been isolated and studied in vitro, but they do not report on the ability of proteins to interact with one another in living cells. We use AFRET (anisotropy-based Förster resonance energy transfer) for this purpose. This method, developed by our collaborator, Mark Rizzo, uses cells transfected to express the proteins of interest, each carrying a different fluorescent fluorphore (e.g., green fluorescent protein and orange fluorescent protein). We then shine polarized laser light on the living cells to excite the shorter wavelength fluorophore. (e.g., green fluorescent protein). After the transfer of energy from the green to the orange fluorescent protein, we measure the intensity of emitted light in planes parallel and perpendicular to that used for illumination, and compared to emission in those planes by the donor (green) and the acceptor (alone). Individual regions of interest are analyzed and the data displayed as scattergrams. 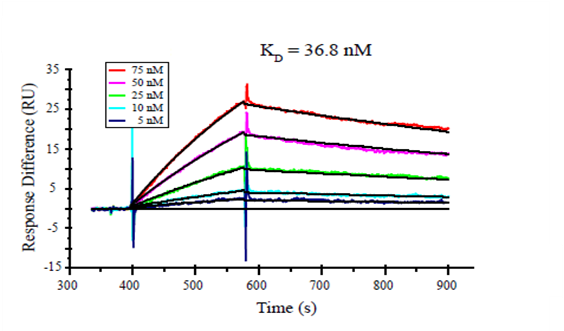 AFRET occurs when significantly energy transfer between the two fluorophores results in more emitted light in the perpedicular plane than that measured from the donor or acceptor alone. AFRET has many advantages over other FRET methods. 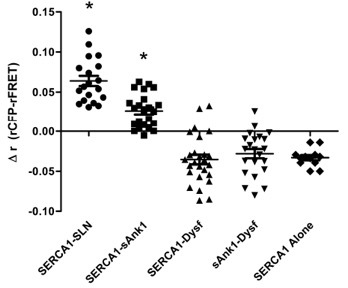 We used it to confirm that SERCA associates closely with sAnk1 (see Intracellular Membranes). Data for one of our studies is shown in the following figure.